I really think I am a Southern girl at heart. I love the Dallas Cowboys (I grew up in Los Angeles), I love country music (my friends were more into the Grateful Dead, INXS, Pink Floyd, and Bob Marley), and I am a sucker for a man with a drawl. My husband is from Virginia and his parents are from a tiny town in Tennessee called Elizabethton. Coincidentally, Jason Witten from the Cowboys is also from Elizabethton. When my in-laws said they were coming to see us I couldn’t help but start planning our their visit. I knew I wanted to cook a traditional Southern meal for them but was kind of stumped on what to serve other than fried chicken. I had been practicing my fried chicken skills and felt I was ready and up for the challenge. I knew I had a number of Southern Party Princesses on my Facebook page that could help me out. Now I know that there are many types of Southerners and each one has their own idea about what a traditional Southern meal consists of. Some serve collard greens, other serve grits, some cornbread, others black eyed peas. I don’t know anything about collards, grits, or black eyed peas but I do know something about cornbread. 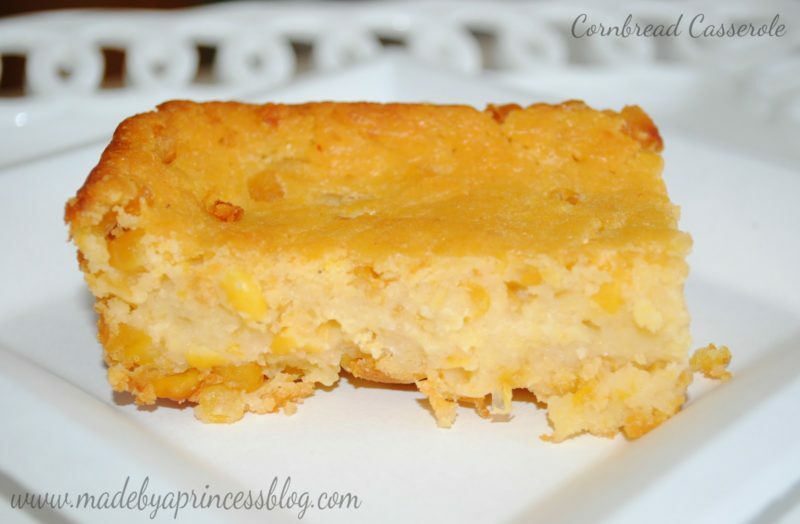 When fellow Party Princess, Jessica Bauman, sent me this recipe for cornbread casserole I knew I had to serve it. My menu was coming together very nicely: fried chicken, salad, sweet tea, cornbread casserole, peach cobbler, and homemade salted caramel ice cream. I was so excited about this meal and couldn’t wait for them to get here. Well, not just for the food. I was really looking forward to seeing my in-laws. Since their visit I have made this several times. I took it took a BBQ and the teenagers came out and told me how much they liked it. My son came over and kissed me on the cheek and told me “thank you for making this.” My friends asked for the recipe. Every single bit was gone and the dish was practically licked clean. This is a keeper! Preheat oven to 350 degrees F. In a mixing bowl, combine butter, whole corn, cream corn, corn muffin mix, sour cream, and sugar. Fold all ingredients together, pour into 2 quart casserole dish. Bake for 1 hour. Thank you so much for sharing this Jessica! I am sticking this recipe in my Must Keep pile.